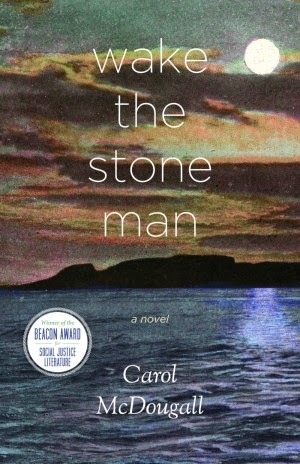 Winner of the Beacon Award for Social Justice Literature, Wake The Stone Man is a complex, multilayered novel, written with such brilliant simplicity. The book follows the friendship of two girls coming of age in the 1960s against the backdrop of social and political changes happening during that time. The setting is a small northern Canadian town and the narrator of the novel is Molly Bell. She considers herself a weird kid. Doesn’t talk much and sometimes she thinks people forget she’s even there. Which is ok by her, as she gets to listen in on conversations. Molly’s a keen observer with an irreverent voice, and it’s no surprise that she absorbs all the minutiae of her surroundings like a sponge absorbing liquid. As a kid, she would constantly stare out onto the wharf, and gaze upon the figure of the Stone Man. He was her friend, always present, always watching, always with a wise word to guide and comfort her. Embodying the form of a man laying across the harbor of Fort McKay, the Stone Man holds the legend of Nanabijou who lay down across the harbor to protect the great secret of the Ojibwe people. Molly first encounter with Nakina, an Ojibwe, is when she is on the outside of the fence of a residential school looking in. Nakina is trying to escape. When she meets her again in high school, a strong bond is formed between the two girls. Molly, who isn’t native herself, finds herself a silent witness to the racism and abuse that Nakina must face every day. Molly turns to her camera to try and make sense of the intolerance she sees. With each photograph she suspends time, and paints it. Over the years, the paintings link her back to a particular time and place. These haunting memories journey with her through the novel, a voyage of self-discovery and the strong desire to do right. As she becomes estranged from Nakina, the paintings are her way to hold on to her friend. Paintings had a way of getting under the skin of photos to the emotional places where words could not go. So much left unsaid. Carol McDougall taps into the little details with such ease and gusto; with just a few words you leave feeling moved and more conscious of the world around you. Wake The Stone Man is a powerful novel that stays with you long after you have finished leafing through its pages and placed the book down. And, as a reader, not only will you gain a keener perspective as you peer into the lens of injustice, but perhaps you may just walk away determined to make the world a better place. Very few novels can attest to having that power. It is no wonder that Wake The Stone Man is the winner of the Beacon Award for Social Justice Literature.